It's going to take some work. Monitoring involves both observing the situations in which your child experiences anxiety and noting how you respond in these situations. The purpose is to accumulate data about both your child's and your behaviours. Monitoring also begins to put some perimeters around your child anxious behaviours, which shifts his focus from fear and anxiety – and whatever situation triggers it – to learning to manage and conquer it. I suggest monitoring your child every day for at least one week. You will find a blank parent monitoring worksheet right here. -make a mental list of the times in your child’s day that you want to observe: waking up, having breakfast, dressing, leaving for school, doing homework, eating dinner, going to bed, and sleeping through the night. Throughout monitoring, I suggest you keep a "facts only" attitude. Keep your observations positive and steer away from judgmental terms. Don't write, "John was at the supermarket and totally freaked out." Instead, stick to the facts and record them as accurately as possible: "at the supermarket, John refuses to touch the shopping cart. He kept his hands in his pockets, seemed irritable, and repeatedly asked them we could leave. When I realised I'd forgotten the ground before tomorrow spaghetti, he became angry. I asked him to run and grab a pound of beef. He tried to convince me to come back on my own the next day. He refused to get the meat. I had to get it myself." Report events, in the same manner, a doctor or observer might use to record your child's behaviour. This practical perspective sets the tone for the treatment to come. Monitoring does not have to be a secret. Be open with your child about this process. A direct and straightforward explanation, such as "I'm gathering information so we can help you worry less," is usually enough. Some children choose to maintain their own worksheets. If your child wants to do this, feel free to encourage it. In my experience, children as young as 11 or 12 are capable of self-monitoring: however, you know your child's abilities, so let that rather than the age be your guide. You will find a child monitoring worksheet below here. Every bit of information can prove useful when developing a treatment plan. Never, however, force a child into self-monitoring. If your child objects to your monitoring his behaviour, explain that this is the useful step and helping him feel better. Ask him what he thinks will happen if you monitor his anxious responses. Perhaps he fears your increased focus on his anxiety will cause them to spend more time thinking about and feeling that anxiety. 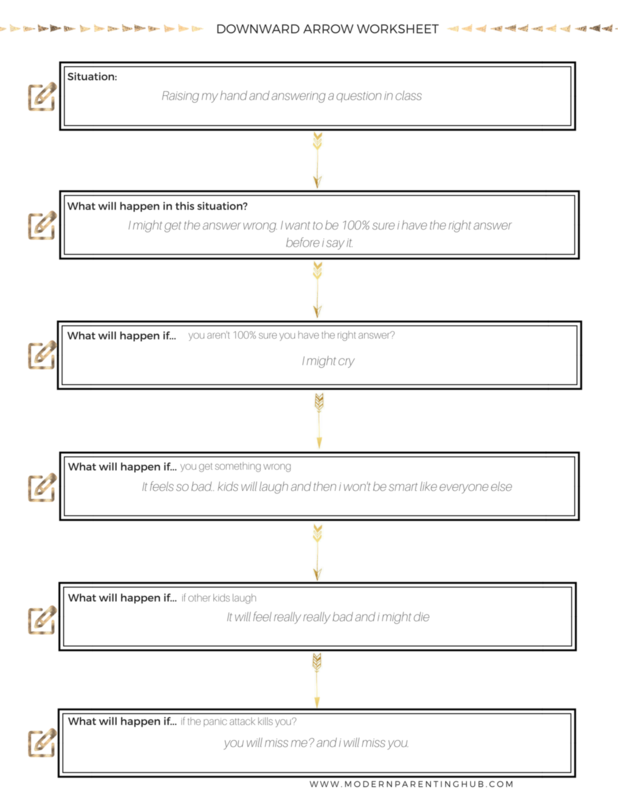 Refer to the "worry hill" (You will learn this in the next educational article called: "Anxiety ToolBox," and explain how every step of the hill brings them closer to coasting down the other side where he will feel less worried. After you have recorded your observations for a week on your Parent Monitoring Worksheets, you should be able to see patterns in your child's behaviour. You will notice that the anxiety behaviours are manifesting in certain types of situations. Then you can sit down with your child and begin to discuss what she fears explicitly about the situation. The downward arrow technique guides you through a series of questions about what your child thinks what happen when she can't avoid a given trigger situation. This allows you to zero in on the consequence of your child fears the most in that situation. Each arrow represents one step closer to the real underlying cause of anxiety. 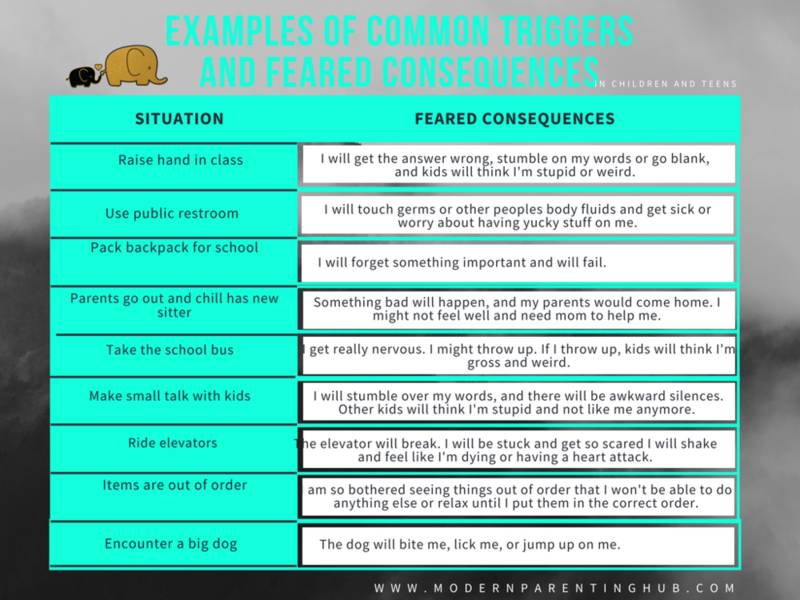 As you use the downward arrow technique with your child, review this next chart, which provides examples of the relationship between trigger situations and fear consequences. This gives you an idea of what you may find for a range of situations. The trick when using the downward arrow technique is to be persistent and to continue asking questions until you reach your child's most feared consequence. This technique can cause some discomfort and anxiety, because your child will have to face his fear in mind, without being in the real-time trigger situation. Ideally, you can have this conversation following an anxiety-provoking incident. Although you do not want to attempt this discussion in the heat of the moment, why a child is still agitated, it is best to apply downward arrow while the situation is still fresh in both of your minds. Engaging in the downward arrow and analysis can have a therapeutic effect on its own. Children are sometimes surprised to discuss their fears in this step – and to see, on paper, the irrational nature of their worries. They likely have been avoiding thinking about them, and so simply bring them to light can have a positive effect. An analogy I like to use with parents and children is the "monster during the night." In the darkness, the child may imagine a monster lurking in the room, but in the light of the day, the scary monster is actually just a big pile of laundry they forgot to put away. The same is true for fear. Shedding light on worries for the downward arrow technique can frequently provide a child with as much more objective perspective on her anxiety. The primary purpose of the downward air technique, however, is to assess your child's fear structure. Resist any temptation to use this technique to prove to her how irrational her fear and consequences are. That would be counterproductive. You and your child will use this information about the structure of his/her worries to move on to the next steps, such as correcting thinking errors, through positive talk, or cognitive behaviour therapy. The last few tips, your child may repeatedly refuse to discuss anxiety in any way. Don't let being rebuffed discouraged you. You may have to wait for the proper opening for your child to be able and willing to verbalise his or her feelings. You may also find you have an emotional reaction of your own to what your child uncovers. The fierce structures of anxious children can seem alarming, sinister, weird, or frustratingly silly. Try not to read too much into what your child tells you. For example, if your child worries about hurting someone by accident or can't get a gruesome image out of their mind, don't assume he has excessive anger or violent tendencies. Maintain a nonjudgmental, curious attitude. If you appear apprehensive, your child may sense this and not trust you with the process. So be supportive and praise your child as she reveals her fears. Go at a pace that seems relatively comfortable for you and your child. If your child seems overwhelmed at any given moment, step back or take a break, but be sure to get back to the process. Remember that, as a parent, you are not/and should not expect yourself to be a clinician/ psychologist. You can help your child by just using information in previous educational articles about anxiety. Having a clear understanding about your child's fears will make it easier when you are explaining to the psychiatrist, therapist, or your family doctor, and is one of the first steps in conquering the child's fears. Finally, if you feel too apprehensive or uncomfortable with the content of the child's concerns, I suggest you contact a cognitive behaviour therapist who is experienced in treating children with anxiety disorders.